July 1, Mexico’s election day, is expected to be complex and historic. Following the 2014 political reform, we will witness the implementation of unprecedented concepts in the political system, such as: the re-election of legislators, the coalition government and independent candidates. Approximately 89 million people are on the voter scrolls –the highest number of citizens eligible to vote in Mexico’s history. Within this figure, we must highlight the participation of young people, since they are a very important variable for the future of the country; in fact, 12 million millennials will vote for the first time Sunday, July 1. We must also bear in mind the vast majority of voters are tired of corruption, insecurity, inequality and decades of low growth. That is why citizens in Mexico are torn between the same model implemented by governments emanating from the Institutional Revolutionary Party (PRI), currently in power, and the National Action Party (PAN)… and another, headed by a man with a leftist ideology who seeks to change the direction of the country, Together We’ll Make History. His unique ability to set the political agenda, since his time as head of government of Mexico City, has afforded him great visibility and an important follower base. During the past 17 years, he has campaigned to become the president of the Republic using a rhetoric based on honesty and promoting policies aimed at helping the poor; thus, becoming the only politician in Mexico who has a personal voter base and not a party-based vote. In other words, the electorate votes for him and not for the party that nominates him. This is the reason why he led a major exodus of politicians (and sympathizers) from other left parties, like the PRD, to his own party, MORENA, in 2014. Between 2000 and 2005, AMLO was the head of government of Mexico City. He proved to be a good administrator of one of the largest metropolises in the world. He implemented cost-cutting measures, improved security and stabilized the city’s debt. To make his actions effective among the most vulnerable groups in the city, AMLO created social programs for children and the elderly. Known as the “boy wonder,” the meteoric rise of Ricardo Anaya in Mexican politics was thanks to former PAN President Gustavo Madero’s support. The young politician held several leadership positions within the party before becoming party president, when Gustavo Madero decided to run for a seat in Congress. 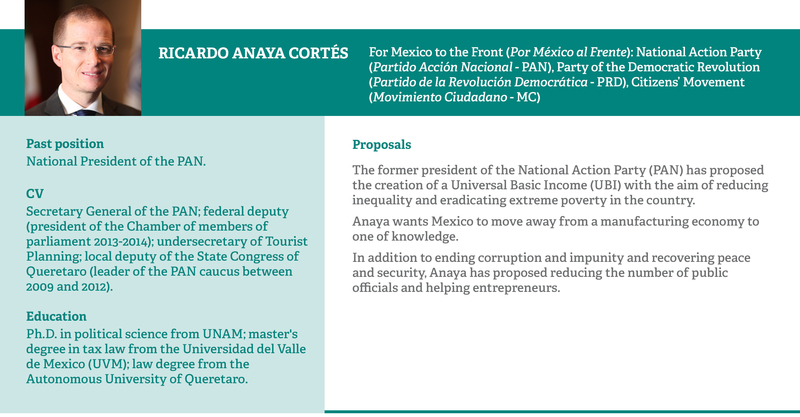 Since the presidency of the PAN, Anaya has made a name thanks to the successes the party has reaped under his management. The 2016 results, where they seized six governorships that belonged to the PRI, including the densely populated Veracruz, for the first time; leading the party to have the largest number of governed states in history (12 of 32 states). Anaya’s rise has been accompanied by pragmatic decisions since his time as leader of the party in the Chamber of parliament members, but some of these decisions have created frictions and divisions within the party, especially when former First Lady Margarita Zavala resigned as a member of the party and decided to run for the presidency as an independent candidate. Jose Antonio Meade is the latest Mexican technocrat. He has demonstrated his competence in different departments under two administrations. “Pepe” Meade has become a political figure at the intersection between the right-wing supporters of the PRI and those of the PAN. Meade, the only remaining secretary of the Calderon administration (PAN), is the son of a former federal PRI member of parliament and undersecretary of the Interior of President Fox (PAN), Dionisio Meade. 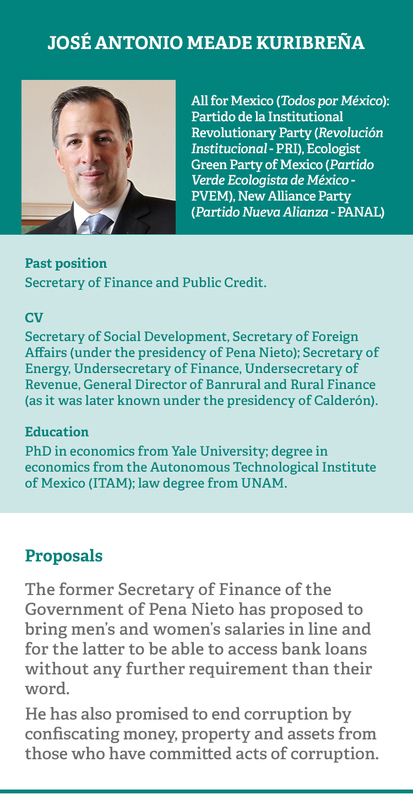 His experience in the financial sector has led two presidents to appoint him secretary of the Treasury at times when the administration had to send out firm signs of stability to the markets from what is essentially the most powerful department of the Mexican government. Thanks to his actions in the past, Meade has increased his visibility during the past year, particularly after the PRI was struggling to find a candidate who could beat the popular Andres Manuel Lopez Obrador from a group of potential candidates who carried with them the weight of the decisions of the acting government. The aggregator of the Oraculus poll, which monitors citizens’ intention to vote with respect to the election of the president of the Republic, indicates the candidate of the coalition Together We’ll Make History (Juntos Haremos Historia) (National Regeneration Movement, Social Encounter Party and Labor Party), Andres Manuel Lopez Obrador, ranks first with 49,5 % (46,4% – 52,3 %), followed by Ricardo Anaya Cortes, from For Mexico to the Front (Por Mexico al Frente) (National Action Party, Democratic Revolution Party, Citizens’ Movement), with 27,8 % (25,4 % – 30,4 %). 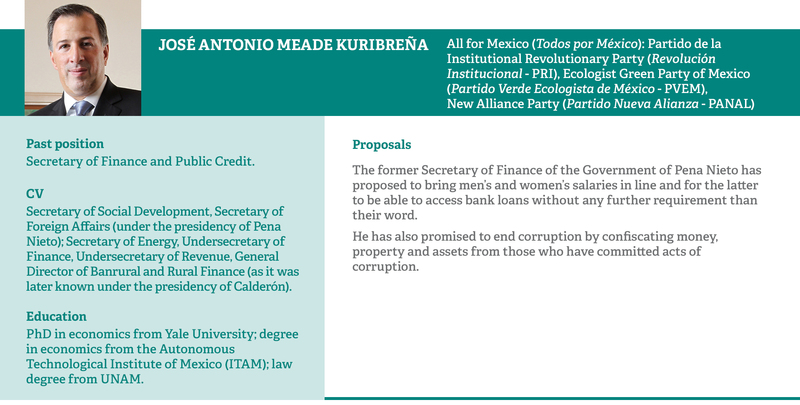 In third place is Jose Antonio Meade, All for Mexico (Todos Por México) (Institutional Revolutionary Party, Green Ecologist Party of Mexico and New Alliance), with 19,9 % (17,9 % – 21,9 %). The battle for the legislature is being fought by two coalitions: one is AMLO as presidential candidate with MORENA as the main party, and the other is Anaya as presidential candidate with the PAN as its greatest strength. It is expected AMLO’s Together We’ll Make History coalition will win most of the seats in both houses. AMLO’s ability to control Congress will be key to his proposals, including a review of the main energy sector reforms enacted in recent years. Even with a simple majority, Lopez Obrador could slow down some issues on the agenda such as energy reform. If the current trend continues, the candidate of Together We’ll Make History, Andres Manuel Lopez Obrador, will be president; however, we must stress, against the backdrop of a complicated economic and social context and regardless of who wins July 1, all Mexicans are aware the way of doing politics and managing country has to be transformed into an exercise committed to transparency, accountability and the fight against insecurity with respect for human rights, among other key issues, for the good of Mexico’s development and progress. Juan has more than 18 years of professional experience, both in Spain, as well as in Mexico and LatAm. 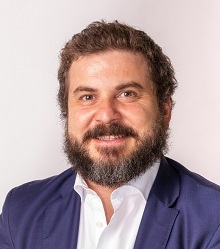 He is a specialist in reputation management and communications, focused on areas of corporate, financial and marketing communications, always based on his digital expertise and helping clients adapt to new environments. Juan has experience in projects undertaken for Coca-Cola, Walmart, Kellogg's, General Electric and Lenovo. Additionally, he combines his professional work with innovation and teaching. He is a lecturer on issues of reputation, new trends in communications and digital transformation. 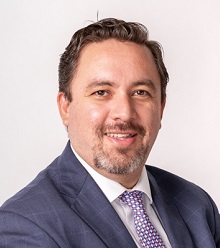 He is currently the joint Managing Director of the office of LLYC Mexico. 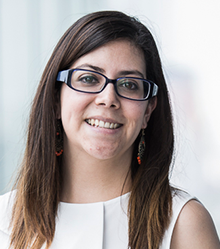 Maria has more than five years of experience in public affairs, strategic communications and electoral campaigns. Before joining LLYC, she supported the generation of political intelligence products for the 2012 presidential campaign of the then candidate of the New Alliance Party. She has also collaborated on writing opinion articles for various national media such as La Jornada, the news portal Eje Central and 24 Horas. In 2014, she joined the public affairs team of LLYC, where she was responsible for supporting the design and implementation of relationship and advocacy strategies in the public agenda. One of the key projects she took part in the consultancy field was the drafting of the Government Relations Manual of Tec de Monterrey. Additionally, Maria has worked on accounts that operate in highly regulated sectors such as food, pharmaceuticals and energy.